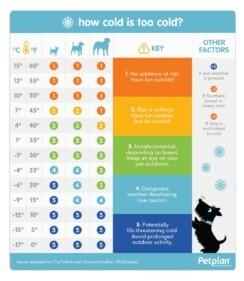 A common question this time of year is, “How cold is too cold for a dog?” The answer is a bit complicated, but thankfully, the good folks at Tufts University already developed a system for animal welfare officers to reference that we can utilize as a guide. The Tufts Animal Condition and Care (TACC) system (PDF) has many parts, ranging from body condition and environmental health to weather safety, and the scores are used as a screening tool for animal health employees to determine if neglect is occurring. I adapted their information into an easy to understand chart—simply find the outdoor temperature (taking into account wind chill, or the temperature that it actually FEELS outside), look at the size of your dog, and voila! You know based on the color if it’s safe for your pup or not.